The Chilean Declaration of Independence is a document declaring the independence of Chile from the Spanish Empire. It was drafted in January 1818 and approved by Supreme Director Bernardo O'Higgins on 12 February 1818 at Talca, despite being dated in Concepción on 1 January 1818. The ceremony of independence was performed on 12 February 1818, the first anniversary of the Battle of Chacabuco. A declaration of independence or declaration of statehood is an assertion by a defined territory that it is independent and constitutes a state. Such places are usually declared from part or all of the territory of another nation or failed nation, or are breakaway territories from within the larger state. In 2010, the UN's International Court of Justice ruled in an advisory opinion in Kosovo that "International law contains no prohibition on declarations of independence", though the state from which the territory wishes to secede may regard the declaration as rebellion, which may lead to a war of independence or a constitutional settlement to resolve the crisis. The Palacio de la Real Audiencia de Santiago is a building located in the north central village of the Plaza de Armas in Santiago, Chile. The building dates back to 1808 and houses, since 1982, the National History Museum of Chile. José Joaquín Prieto Vial was a Chilean military and political figure. He was twice President of Chile between 1831 and 1841. José Joaquín Prieto was of Spanish and Basque descent. ¿Jura usted defender la patria hasta derramar la última gota de sangre, para conservarla ilesa hasta depositarla en manos del señor don Fernando VII, nuestro soberano, o de su legítimo sucesor; conservar y guardar nuestra religión y leyes; hacer justicia y reconocer al supremo Consejero de Regencia como representante de la majestad Real? Do you swear to defend the fatherland to the last drop of your blood, to keep it unharmed in the hands of Fernando VII, our lord, or his rightful heir; to uphold and protect our religion and our laws; to maintain justice and recognize the supreme Counselor of the Regency as the representative of His Royal Majesty? Ferdinand VII was twice King of Spain: in 1808 and again from 1813 to his death. He was known to his supporters as the Desired and to his detractors as the Felon King. After being overthrown by Napoleon in 1808 he linked his monarchy to counter-revolution and reactionary policies that produced a deep rift in Spain between his forces on the right and liberals on the left. Back in power in 1814, he reestablished the absolutist monarchy and rejected the liberal constitution of 1812. A revolt in 1820 led by Rafael de Riego forced him to restore the constitution thus beginning the Liberal Triennium: a three year period of liberal rule. In 1823 the Congress of Verona authorized a successful French intervention restoring him to absolute power for the second time. He suppressed the liberal press from 1814 to 1833 and jailed many of its editors and writers. Under his rule, Spain lost nearly all of its American possessions, and the country entered into civil war on his death. By 1817, the Chilean War of Independence had entered its final phase, and there was little doubt that its final goal, national independence, would be realized. Even though Chile had been operating independently from Spain for several years, no formal declaration of independence had yet been produced. 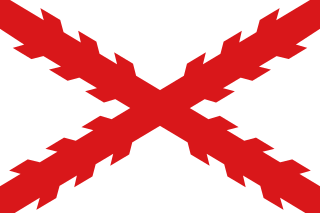 The Chilean War of Independence was a war between pro-independence Chilean criollos seeking political and economic independence from Spain and royalist criollos supporting continued allegiance to the Captaincy General of Chile and membership of the Spanish Empire. One of the first official documents to address the issue of independence was the Provisional Constitutional Regulations of 1812, introduced by José Miguel Carrera on 27 October 1812. 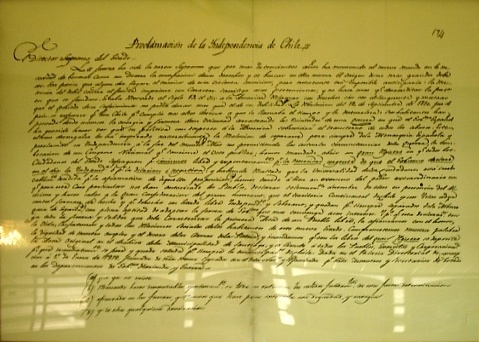 Article V of this document states that "No decree, ruling or order, issued by any authority or courts outside the territory of Chile, will have any effect; anyone who tries to give them force will be punished as criminals of the State", while also recognizing the authority of Fernando VII in Article III. José Miguel Carrera Verdugo was a Chilean general, member of the prominent Carrera family, and considered one of the founders of independent Chile. Carrera was the most important leader of the Chilean War of Independence during the period of the Patria Vieja. After the Spanish Reconquista ("Reconquest"), he continued campaigning from exile. His opposition to the leaders of independent Argentina and Chile San Martin and O'Higgins respectively made him to live in exile in Montevideo. From Montevideo Carrera traveled to Argentina where he joined the struggle against the unitarians. Carreras' small army was eventually left isolated in the Province of Buenos Aires from the other federalist forces. In this difficult situation Carrera decided to cross to native-controlled lands all the way to Chile to once for all overthrow Chilean Supreme Director O'Higgins. His passage to Chile, which was his ultimate goal, was opposed by Argentine politicians and he engaged together with indigenous tribes, among the Ranquels, in a campaign against the southern provinces of Argentina. After the downfall of Carreras' ally, the Republic of Entre Ríos, and several victories against the United Provinces of the Río de la Plata Carrera's men were finally defeated by numerically superior forces near Mendoza. Carrera was then betrayed by one of his Argentine helpers, leading to his capture and execution in that city. José Miguel Carrera was of Basque descent. 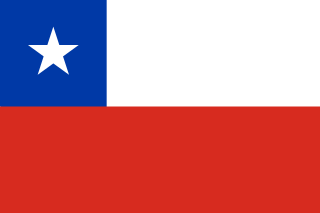 The flag of Chile consists of two equal horizontal bands of white and red, with a blue square the same height as the white band in the canton, which bears a white five-pointed star in the center. It was adopted on 18 October 1817. The Chilean flag is also known in Spanish as La Estrella Solitaria. The coat of arms of Chile dates from 1834 and was designed by the English artist Charles Wood Taylor (1792-1856). It is made up by a figurative background divided in two equal parts: the top one is blue and the bottom, red. A five pointed white star is in the centre of the shield. This background is supported in one side by a condor, the most significant bird of prey from the Andes, and in the other, by a huemul, a mammal endemic to Chile. Both animals wear golden naval crowns symbolising the heroic deeds of the Chilean Navy in the Pacific Ocean. The President of Chile, Bernardo O'Higgins, bore in mind the problems experienced by the previous era, and convinced the members of his assembly that declaring independence would be difficult and problematic at this time, as the country was still warring against the Spanish Royalists and because the establishment of internal order was indispensable towards the goal of independence. Therefore, it was decided that a plebiscite would be held instead. On 13 November 1817, the Superior Governmental Junta, in the absence of O'Higgins, who was overseeing military operations in the southern part of Chile, issued a decree declaring that a referendum was to be set up to run for fifteen days. The referendum would be held in each of the four administrative quarters of Santiago, and would run for fifteen days, during which residents would sign their views in favor or against the Declaration of Independence. Cities and towns were advised to follow the same procedure. During the month of December, after checking the results, the government began preparations to make a solemn declaration of independence. This coincided with news about the upcoming arrival of a new Royalist expedition under the command of Spanish Brigadier Mariano Osorio, aimed at reconquering Chile. The formal ceremony and pledge of independence was set for the first anniversary of the Battle of Chacabuco: 12 February 1818. On 9 February, Luis de la Cruz published the program of the ceremonies and celebration to be held in Santiago. These activities commenced on 11 February in the afternoon with the firing of cannons from Cerro Santa Lucía. At nine o'clock on 12 February, all the authorities and people of the Palacio Directorial de Santiago mounted a stage in front of the Plaza de Armas in Santiago. In Talca, on 12 February, O'Higgins presided over the swearing-in of the Independent Southern Army, and the subsequent ceremony with ceremonial gunfire, a Mass, Te Deum and public festivities. During these few days, the declaration of independence was made in many other cities and towns of Chile, with as many festivities as could be had. In La Serena, independence was declared on 27 February and the festivities lasted until 1 March  and in Copiapó the ceremony took place between March 27 and 28. On 15 June 1820, Valdivia was sworn into the new nation, after Thomas Cochrane led a successful attempt to capture Valdivia from the royalists. Later, on 22 January 1826, the pledge of independence would be made in San Carlos, Chiloé, after the Spanish signed the Treaty of Tantauco, which gave the Chiloé Archipelago to Chile. ↑ Bernardo O’Higgins erroneously appears in this recreation, as he was actually in Talca on that day. Bernardo O'Higgins Riquelme was a Chilean independence leader who freed Chile from Spanish rule in the Chilean War of Independence. He was a wealthy landowner of Spanish and Irish ancestry. Although he was the second Supreme Director of Chile (1817–1823), he is considered one of Chile's founding fathers, as he was the first holder of this title to head a fully independent Chilean state. Francisco Casimiro Marcó del Pont Ángel Díaz y Méndez was a Spanish soldier and the last Governor of Chile. He was one of the main figures of the Chilean independence process, being the final Spaniard to rule as Royal Governor of Chile from 1815 to 1817, when he was deposed and captured by the patriot forces after the Battle of Chacabuco. Grand Marshal Juan Gregorio de Las Heras was an Argentine soldier who took part in the Spanish American wars of independence and was also a governor of the province of Buenos Aires. Brigadier Juan Mackenna was an Irish-born, Chilean military officer and hero of the Chilean War of Independence. He is considered to have been the creator of the Corps of Military Engineers of the Chilean Army. Colonel Luis Florentino Juan Manuel Silvestre de los Dolores de la Carrera y Verdugo was a Chilean military officer who fought in the Chilean War of Independence. Together with his brothers José Miguel and Juan José, they were some of most important leaders of Chilean struggle for independence during the period of the Patria Vieja. The Carrera family is of Basque origin. General Fernando Baquedano Rodríguez was a Chilean military and political figure who served in the Chilean War of Independence and the War of the Confederation. Fernando Baquedano was of Basque descent, his ascendants came from Abarzuza. Vicente San Bruno Rovira was a Spanish military officer, infamous for his cruelty during the Chilean War of Independence. Antonio de Guill y Gonzaga was a Spanish colonial administrator who served as Royal Governor of Panama and Royal Governor of Chile. Patria Nueva was a period in the history of Chile that began with the victory of Ejército de los Andes in the Battle of Chacabuco on 12 February 1817 and ended with the resignation of Bernardo O'Higgins as Supreme Director in 1823. Águila was the first naval vessel of the Chilean Navy. She was later renamed Pueyrredón. The First Chilean Navy Squadron was the heterogeneous naval force that terminated temporarily Spanish colonial rule on the south-west coast of South America, and protagonized the most important naval actions of Chile in the Latin American wars of independence. The Chilean revolutionary government organized the squadron in order to carry the war to the Viceroyalty of Perú, then the center of Spanish power in South America, and thus secure the independence of Chile and Argentina. Benjamín Vicuña Mackenna was a Chilean writer, journalist, historian and politician. Vicuña Mackenna was of Irish and Basque descent. The Legion of Merit of Chile, frequently abbreviated to the Legion of Merit or the Legion, was a Chilean multi-class order of merit established on 1 June 1817 by Bernardo O'Higgins to recognise distinguished personal merit contributing to the independence of Chile or to the nation. Membership of the Legion conferred a variety of privileges in Chile and its members were entitled to wear insignia according to the class conferred. The Legion of Merit of Chile was abolished in 1825. Manuel Olaguer Feliú, was a military engineer who became Field Marshal and Captain General of Galicia. 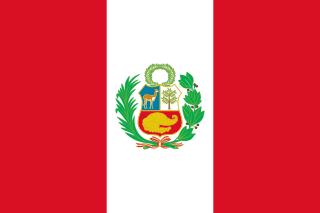 Participated in the colonial wars in the Captaincy General of Chile and the Viceroyalty of Peru. Luis De la Cruz y Goyeneche was a Chilean politician and military, son of Pablo De la Cruz and Antonia de Goyeneche y Lope de Lara. His father was born in Tabernas (Spain) in 1714 and was a military who came to Chile in 1740. Ambrosio Bernardo O'Higgins, 1st Marquess of Osorno born Ambrose Bernard O'Higgins, was a Spanish colonial administrator and a member of the O'Higgins family. He served the Spanish Empire as captain general of Chile (1788–1796) and viceroy of Peru (1796–1801). Chilean independence leader Bernardo O'Higgins was his son. The following lists events that happened during 1817 in Chile. 1 2 3 4 5 6 Barros Arana, Diego (1890). "Arribo y desembarco de la expedición española: proclamación y jura de la indepedencia de Chile (Diciembre de 1817—Febrero de 1818)". Historia General de Chile[General History of Chile] (in Spanish). Volume XII. Santiago: Imprenta Cervantes. ↑ Encina, Francisco (1984). "La expedición de Osorio. Proclamación de la Independencia de Chile" [The expedition of Osorio. Proclamation of the Independence of Chile]. Historia de Chile desde la Prehistoria hasta 1891[History of Chile from Prehistory to 1891] (in Spanish). Volume XIV. Santiago: Editorial Ercilla. ↑ Fernández Ruiz, Roberto (17 September 2006). "¿Dónde se firmó el Acta de la Independencia?" [Where was the Act of Independence signed?]. El Sur (in Spanish). Concepción. Retrieved 9 August 2018. ↑ "Destacados del año 1973" (in Spanish). Medios Digitales Copesa. Archived from the original on 30 September 2007. Retrieved 9 August 2018. 1 2 Correa Bello, Sergio (1991). "Historia del Plebiscito 1817-1818" [History of the Plebiscite 1817-1818]. IX Jornadas de Historia de Chile[Ninth Conference on the History of Chile] (in Spanish). La Serena: University of La Serena. ↑ "Acta de la Independencia de Chile" (in Spanish). Biblioteca del Congreso Nacional de Chile. Retrieved 9 August 2018. ↑ "Historia de Talcahuano" (in Spanish). I. Municipalidad de Talcahuano. Archived from the original on 16 July 2006. Retrieved 9 August 2018. ↑ "Historia de Concepción. Declaración de la Independencia" (in Spanish). Municipalidad de Concepción. Archived from the original on 25 February 2008. Retrieved 9 August 2018. 1 2 Barros Arana, Diego (1890). "Solemnidades y entusiasmo con que se hace la proclamación y jura de la independencia" [Solemnities and enthusiasms with which the proclamation and pledge of independence were made]. Historia General de Chile[General History of Chile] (in Spanish). Volume XII. Santiago, Chile: Imprenta Cervantes. ↑ Concha, Manuel (1871). Crónica de La Serena, desde su fundación hasta nuestros días. 1549-1870[Chronicle of La Serena, from its foundation to the present day. 1549-1870] (in Spanish). La Serena, Chile: Imprenta de La Reforma. p. 120. Frías Valenzuela, Francisco (November 1993) . Historia de Chile. Desde la Prehistoria hasta 1973[History of Chile. From prehistory to 1973] (in Spanish) (11th ed.). Santiago: Empresa Editora Zig-Zag. ISBN 956-12-0766-4. Valencia Avaria, Luis (1942). "La declaración de la independencia de Chile" [The declaration of independence of Chile]. Boletín de la Academia Chilena de la Historia (in Spanish). IX (23).